Stir-fry Fortnight II – What Ingredients? If plain stir-fry is the least known stir-fry variation in America, then moist stir-fry is the best known. The gooey, tasteless sauces in “Chop Suey” and Moo Goo Gai Pan found in so many Chinese-American restaurants all rely on this technique. Whoever created these recipes obviously had a special affinity for this common technique and used it ad nauseum. 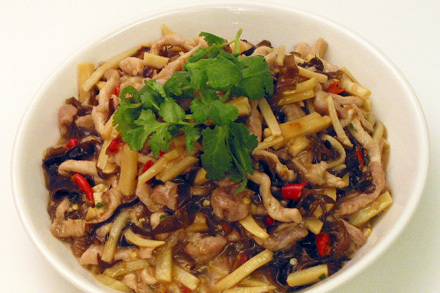 Just as the name implies moist stir-fry (滑炒 or hua chao) creates a dish with a sauce, which is the key to its flavor. Matching complementary sauce ingredients with the main ingredient is important to a successful dish. I cannot tell you how many Chinese sauces have been abused by Chinese take-out restaurants. Hoisin sauce among them has become, I believe, the bane of American Chinese cooking. Search through sample Chinese stir-fry recipes on the Internet and you’ll find plenty that call for Hoisin sauce. It is the base for all the universal and uniformly uninteresting “brown sauces,” which seem to cover so much Chinese restaurant food. 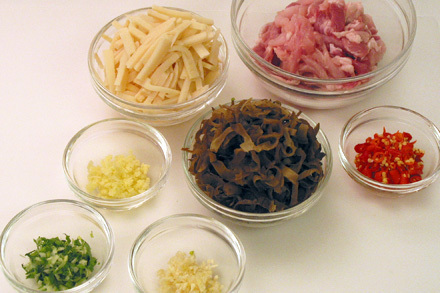 Sauces used in moist stir-fry define regional cooking styles. In Cantonese cooking oyster sauce, abalone sauce or garlic sauce are common. These sauces complement the wealth of seafood, vegetables and game meats of the region. Sichuan cooking uses a variety of hot and spicy sauces, many based on hot bean paste and pickled red chili. Since most Americans are more familiar with Cantonese cooking, I decided to share a fiery hot moist stir-fry dish from Sichuan called YuXiang Stir-fry Pork (魚香肉絲). YuXiang literally means “fragrant fish”. Although it’s fragrant, there is no fish in the dish. 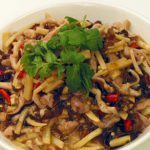 Legend has it that one night, when her husband arrived home early, a devoted, but harried housewife put together a pork stir-fry dish and tossed in some leftover fragrant fish sauce that was lying around the kitchen. The pork was such a hit with her husband that she started using the sauce successively in more and more dishes. And the tradition continues. The cooking process for the moist stir-fry closely resembles the procedure, which I described in my stir-fry introductory post. Follow the recipe closely and you will create an authentic, spicy and very satisfying Sichuan dish, which will undoubtedly impress your friends. This is a very spicy dish that relies on heat from pickled chili, which can be purchased from Chinatown markets. In Sichuan many cooks would likely double the amount of chili I specified. But you can adjust the amount to suit your own taste. Cut both the pork and bamboo shoots into thin strips of about 1/8 inch thickness and set aside. Soak dry wood ear mushroom in hot water until soft. Shreds it to about 1/8 inch thickness also and set aside. Marinate the pork for at least about 20 minutes. Mix the wet ingredients of the sauce including light soy sauce, Shaoxing cooking wine, dark Chinese vinegar, and water along with sugar and cornstarch then set aside. Heat the two tablespoons of vegetable oil in a wok on high heat until it just begins to smoke. Drop the pork into the wok and quickly stir-fry to separate the shreds. Cook until the meat just turns color, about 2 minutes. Scoop and drain the pork and put in a bowl. Leave about 1 tablespoon of oil in the wok and put the garlic, scallion, ginger and pickled chili in. Stir-fry them for about 30 seconds or until the oil is fragrant. Put in the bamboo shoots and wood ear mushrooms and stir-fry for about a minute. Return the partially cooked pork to the wok and add the sauce mixture. Continue to stir-fry until the sauce is thickened. Plate and you’re ready to serve. I picked this recipe to try tonight because I had never cooked with wooden ear mushrooms before, and it was delicious! I didn’t have any black vinegar in the house, so I used Chinkiang vinegar, which made the dish a little too strong. The mushrooms definitely soaked up the vinegar, but the pork had just the right flavor. I also used dried bamboo shoots, since that’s what I had in the house. The pickled peppers are a great addition to my pantry! Can you please tell me how would you adjust this recipe for eggplant (鱼香茄子)? I lived in Beijing for years, and this was one of those dished you could get everywhere, and one of my all time favorite dishes. I live in New York, but haven’t found a place that doesn’t do it as sweet, sticky and overly garlicky. What would you suggest? I would simply replace the pork with strips of Chinese eggplant cut to about 2 inches long and half an inch wide. Use about three cupful of the eggplants. They will shrink as you cook them. Deep fry the eggplant strips first before in the wok with about three inches deep of vegetable oil. Make sure the oil is just about reaching smoking point before adding the eggplant. You should only fry them for about one minute. Drain the eggplant strips on a paper towel. They will continue to cook for a while. Now follow the rest of the steps in frying the garlic and ginger. You should be able to recreate a delicious YuXiang Eggplant. Hi, do you mind telling me what “pickled red chili” is in Chinese? I’m not familiar with this ingredient, knowing the Chinese would help me find it in Chinatown. Thanks! 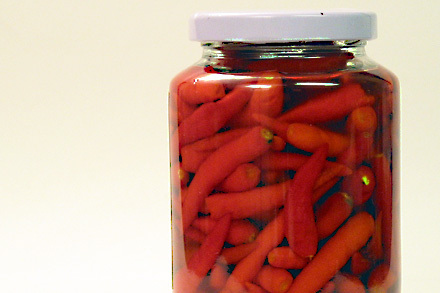 Hi Lucy, Pickled red chili is commonly known as 泡辣椒 (pao la jiao in Mandarin). They often come in glass jars. There are a few different brands available in Asian markets. Some are from China but many are from Thailand. Different chili from various suppliers have different level of spiciness. So do adjust the amount to your liking. Thank you, Kian. Will be making this dish soon. I do believe I was successful! My dish looked pretty similar to your photo and it tasted wonderful. Thank you again! Lucy, That looks totally yummy! I’m glad you enjoyed the recipe. This is a classic Sichuan dish that’s always a crowd pleaser. You can make this with eggplant as well.